Researchers are using Opportunity this month to examine rocks that may have been chemically altered by water billions of years ago. The mission's current targets of investigation are from ruddy-tinted swaths the researchers call "red zones," in contrast to tan bedrock around these zones. 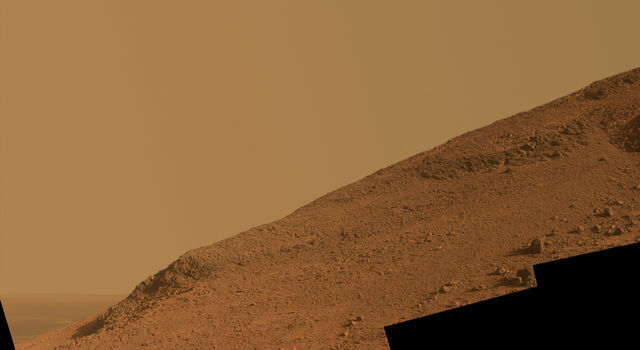 The targets lie on "Knudsen Ridge," atop the southern flank of "Marathon Valley," which slices through the western rim of Endeavour Crater. "We're hoping to take advantage of the steep topography that Mars provides us at Knudsen Ridge to get to a better example of the red zone material," said Steve Squyres of Cornell University, Ithaca, New York, principal investigator for the mission. The red zone material crumbles easily. At locations in Marathon Valley where Opportunity already got a close look at it, the reddish bits are blended with other loose material accumulating in low locations. 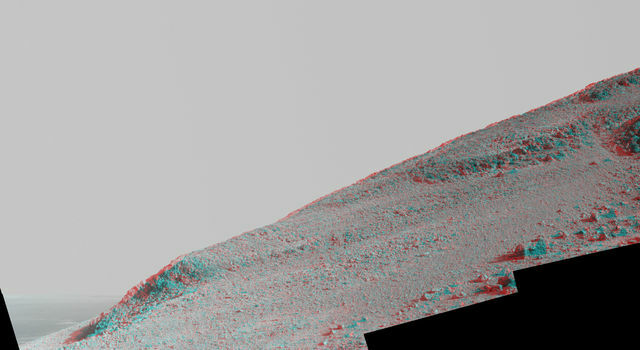 A purer exposure of the red zone material, such as some apparent on the ridge, would provide a better target for the Alpha Particle X-ray Spectrometer on Opportunity's arm, which reveals the chemical composition of rocks and soil. 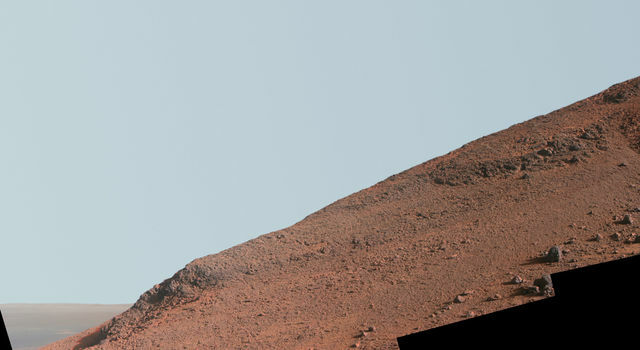 Opportunity began climbing Knudsen Ridge in late January with two drives totaling 31 feet (9.4 meters). The wheels slipped less than 20 percent up slopes as steep as 30 degrees, the steepest the rover has driven since its first year on Mars in 2004. The slip is calculated by comparing the distance the rotating wheels would have covered if there were no slippage to the distance actually covered in the drive, based on "visual odometry" imaging of the terrain the rover passes as it drives. "Opportunity showed us how sure-footed she still is," said Mars Exploration Rover Project Manager John Callas at NASA's Jet Propulsion Laboratory, Pasadena, California. "The wheel slip has been much less than we expected on such steep slopes." The rover made additional progress toward targets of red-zone material on Knudsen Ridge with a drive on Feb. 18. Knudsen Ridge forms a dramatic cap overlooking the 14-mile-wide (22-kilometer-wide) Endeavour Crater. Its informal naming honors the memory of Danish astrophysicist and planetary scientist Jens Martin Knudsen (1930-2005), a founding member of the science team for Opportunity and the twin rover Spirit. "This ridge is so spectacular, it seemed like an appropriate place to name for Jens Martin," Squyres said. Marathon Valley became a high-priority destination for the Opportunity mission when mineral-mapping observations by the Compact Reconnaissance Imaging Spectrometer for Mars (CRISM), aboard NASA's Mars Reconnaissance Orbiter, located clay minerals (a type of phyllosilicate) in this valley. Clay minerals often form in the presence of water, which is why this is such a promising area of exploration. Opportunity found evidence of ancient water shortly after landing, but there were signs that the water would have been more highly acidic. The investigation in Marathon Valley could add understanding about the ancient environmental context for the presence of non-acidic water, a factor favorable for microbial life, if any has ever existed on Mars. 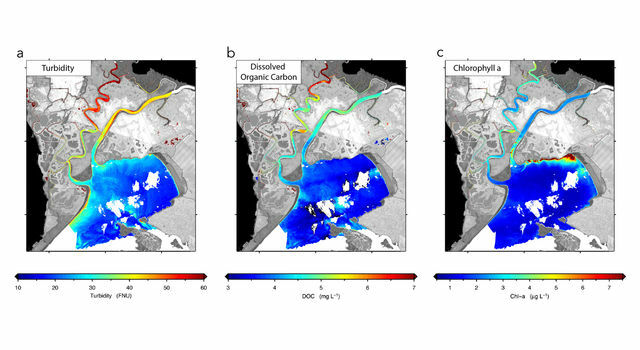 "The locations of red zones in Marathon Valley correlate closely with the phyllosilicate signature we see from orbit," Squyres said. "That alone is not a smoking gun. 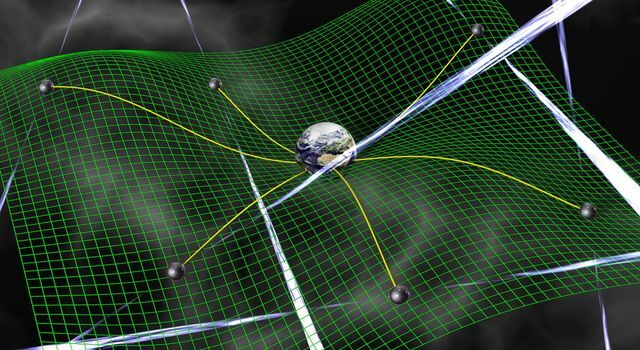 We want to determine what it is about their chemistry that sets them apart and what it could have to do with water." The team is accomplishing productive science with Opportunity while avoiding use of the rover's flash memory, which was linked to several unplanned computer reboots last year. The only data being received from Opportunity is what can be transmitted each day before the solar-powered rover shuts down for energy-conserving overnight "sleep."